This 5 day survival course has been designed for anyone who wants to learn some of the skills that are essential in a survival situation. We’ve put this course together for people who spend time outdoors in the UK and would like to be better prepared in the event of an emergency. You don’t need any previous experience to come along, we’ll start with the basics and work at a steady pace to ensure that you get the most from your time with us. Gain an understanding of how survival scenarios come about, and how to avoid getting into one! Understand why you should make your own survival kit, and what should go in it. On the morning of day 4 we will take you to the other end of our beautiful ancient woodland where you will spend 2 days and a night. Carrying only minimal kit, you’ll need to build a shelter, light a fire, find, filter and purify water and prepare your meals from game we provide. Don’t worry, we’ll be moving with you to keep an eye on things, but will only act where necessary. At the end of this 5 day survival course you’ll have learnt how to avoid getting into a survival situation as well as gained a good working knowledge and experience of some of the skills should you find yourself in one. I was brought this course by my parents this year i can honestly say it as been the best present yet. every activity was exciting and informative. everything you learn while out there helps build up to the overnight on your own. Defo coming on another course from jack raven! As a foreigner who is not in a language, it is very happy to be able to complete the 5-day survival course with the help of the mentors and the jacky. In 5 days you can learn all the basic knowledge that survive in the jungle, including the search and use of resources, the source of fire and the maintenance, the acquisition of food, processing and cooking (of course as Chinese cooking method or a lot) 🙂 the basic survival knowledge and details, such as the construction of shelter, benefit greatly. The patience guidance of the coaches, the mutual help of the Jacky, the coach who is good at cooking, the beautiful resource rich jungle, which is an unforgettable course. Finished a challenge in my life! always friendly and always professional. I've been on 3 courses with the Jack Raven team and have learnt a huge amount. This is the course to do to discover how far you can push yourself in mind, body and spirit. It also gives you a chance to discover what it takes to survive as an individual and/or in a group.The most important thing you learn is 'Enough is never enough'. A huge big thank you to Gary, Bob, Peter, Nicola anf Willow for making this a remarkable course. My 2nd course with the excellent people at Jack Raven and certainly not my last! The course material covers a wide range of topics, none of which where superfluous to surving a night in the woods. I genuinely feel like I would now not be totally lost and doomed in a survival situation and left with a sense of pride in what I'd been able to accomplish. 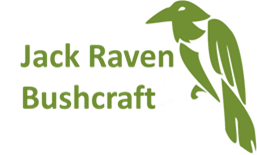 Many thanks to the Jack Raven team, both the two legged and 4 legged members. Time to choose my next course!